I was fighting off tears at about six different points in this book despite it being reasonably short at around 200 pages. 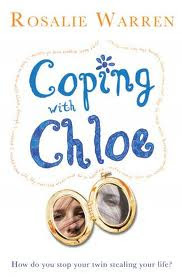 Warren captures the desolation of a child after a sibling's death perfectly, leaving the reader to decide whether Chloe is 'really' there or whether she's a manifestation of her twin's grief. I leant one way for most of the novel but got pushed another way towards the end, leaving me rather confused – but to be honest it's probably not that important which you believe, the book works equally well either way. There are also other fairly major issues involved in the novel, including child abuse, bullying, and parental separation, but Warren handles these all deftly and has enough lightness of touch to mean that while it's always a really emotional read, she manages to stop things from ever getting too overwhelmingly bad. I loved the character of Anna in particular – but also had a soft spot for Miss Tough – and found her parents incredibly realistic, if phenomenally annoying. Joe was the one character I had slightly more mixed feelings on, finding his willingness to talk to the dead Chloe rather more unsettling than I think Warren intended. As love triangles go, this is definitely amongst the most bizarre I've ever read but the romance actually works reasonably well. Warren also does a great job of capturing the nastiness of bully Lisa and her hangers-on, and readers will be desperate to see her get her well-deserved comeuppance. This has established Warren as an author I'm keen to read more of in the future and I wouldn't hesitate to recommend it to young teen readers, but it's an original enough idea and execution that people several years older than the characters here will still enjoy it. Thank you for the lovely review. So glad you liked 'Chloe'.